https://en.m.wikipedia.org/wiki/Arctic_char it would appear they are related to salmon and look like trout. A bit slow on DOW lately when it comes to project reports, except for Wayne of course - he is never slow. My progress seems ridiculous by comparison, but I thought I´d share it anyway. Pic 1: Inner housing welded to burntube. Pic 4: This old moonshiner was just minutes from going to the scrapyard. Rescued it from my neighbours trailer. My newest candidate for a hopper. Looks closed and tight; hardly leaking welds anywhere it seems. I note, that you are taking the sucking return stream into account and adding cooling fins on the outside benefitting the air pre-heating a bit too. 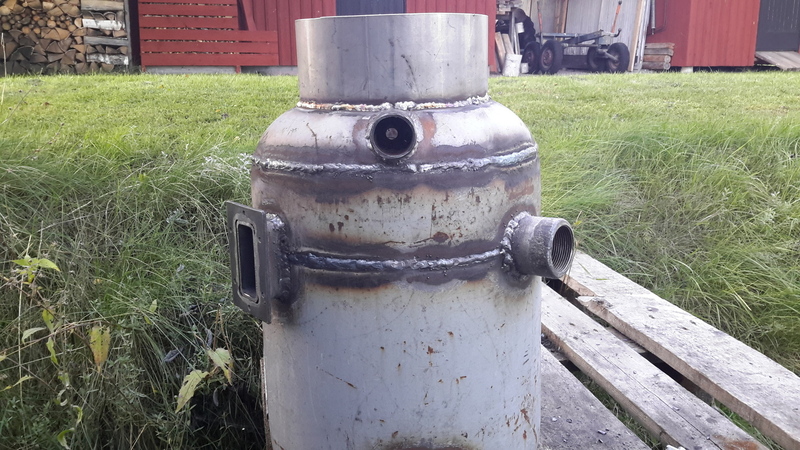 Are you going to weld the silo to the hearth-part too? Lucky find and timing on the moonshiner! Important welds are water tested. I don’t trust my welding skills enough not to. Air will enter the outer container at the bottom inlet, shown only at the top of this topic, and swirl around the gas container. It will then enter the fin jacket through “blowholes” and hopefully cool the nozzle area some. When I know I won’t wet the cyklone I’ll start first heat stealing there. I’ve decided to go for longer nozzles (and smaller restriction = 2,5") to start with. 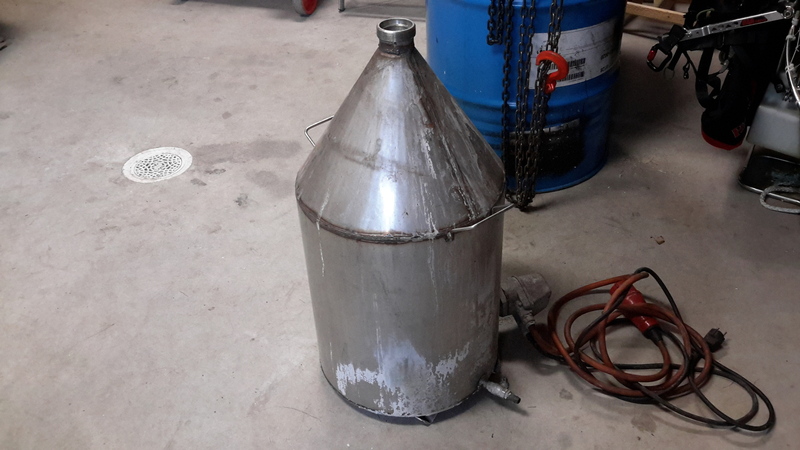 If you make the top lid for full silo diameter, you have the advantage to be able to lift up a loose condensing inner mantel, standing in the gutter, where the conical tapering starts. The loose cylinder should have slant ventilation slots near the upper edge and just above the gutter edge. 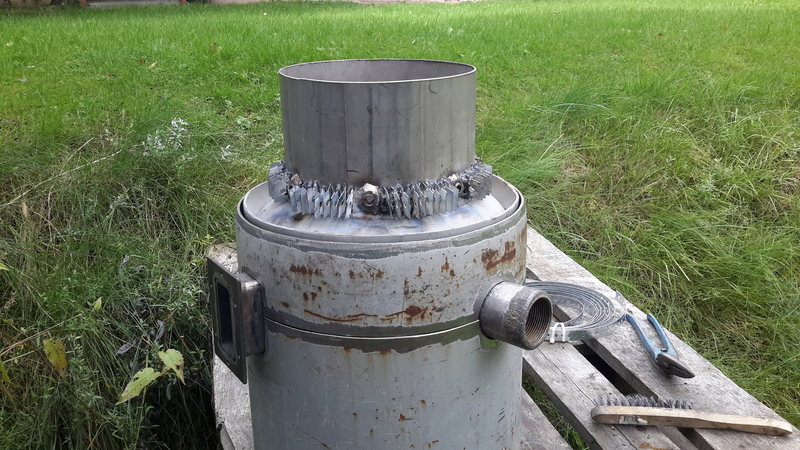 It will form a “negative draft chimney”, much more effective than a net or mesh, which is all the way disturbed and inteferred by “mixing in” hotter gases from the center parts. This way you will get an effective convection circulation, yealding more condense. Spot on my thinking, except I first planed making funnel and inner mantel one piece. Might catch even more water If I do it your way (mantel in gutter). Adding WK tubes as well is of course an option too. One thing at a time. “One at a time”, but in the same region of build: The U-profile gutter has not to be welded, neigther has the loose inner condense mantel. They can both be easily lifted out for cleaning. Make the gutter as a “piston ring”. Make it 1" short of a complete circle. Make 5mm (3/16") thick stainless gables welded to the ends of the gutter. Before welding them in place, bore and thread one of the gables for a 13mm (1/2") bolt. Screw the bolt 2" long all in (from outside the gutter). Then put the gutter in place and unscrew the bolt, so it pushes hard against the other gable. This will enlarge the “piston ring” enough to keep it in place. This makes it easy to vary the tilting angle for good flow. Make the inner mantel accordingly “skew” in the bottom end, so it stands vertically in line with the silo. Make a “hack” in the mantel, so it can “step” over the gable area. Make a bent plate over the gables, from one gutter-end to the other one, to avoid dripping condense between the gables. The gutter draining point (lowest point) opposite the gables of the “piston ring”. Hope you don’t mind a few questions. I’m about to cut my firetube to proper length. It protrudes the top plate (dome) which is only 1" above the nozzles. Keep in mind this is only an 8" firetube. Should I cut it almost flush or save some protruding? 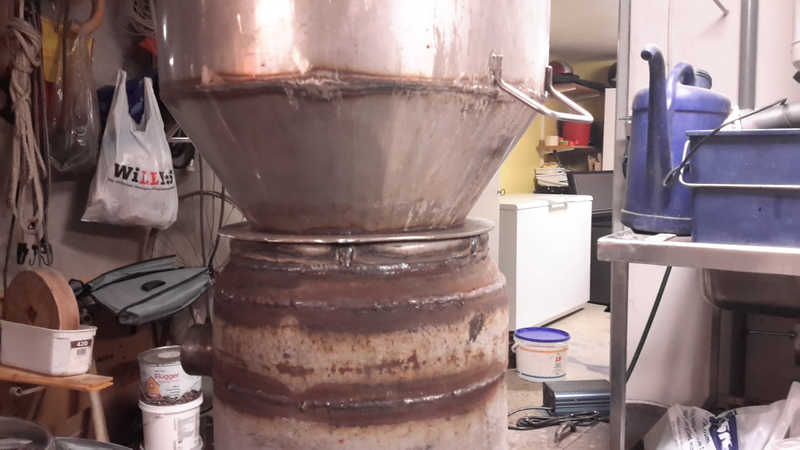 My thinking is flush and that toasted wood early in the funnel is a good thing, preventing bridging. I might be wrong. How close to the nozzles will the funnel stripes (barrel material) survive? Flush or protruding I think will make little difference . I think more important is keeping the fire tube perpendicular to the top plate so the materials added around the fire tube later will line up and be plum . I hope Carl won’t mind me stealing his idea. Made sacrificial plates for nozzle area to see if they will stand short nozzle heat. Firetube will be cut off right above plates. 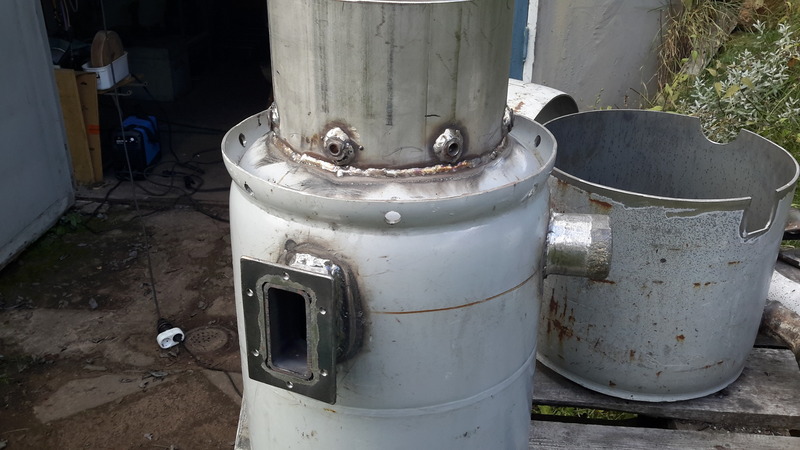 Cut the moonshiner apart and welded flange to it. 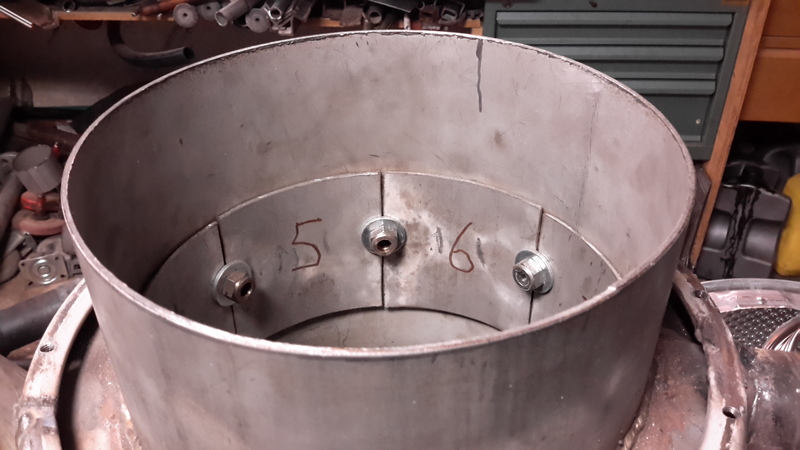 It’ll be bolted to gasifier flange which is welded to topplate dome. 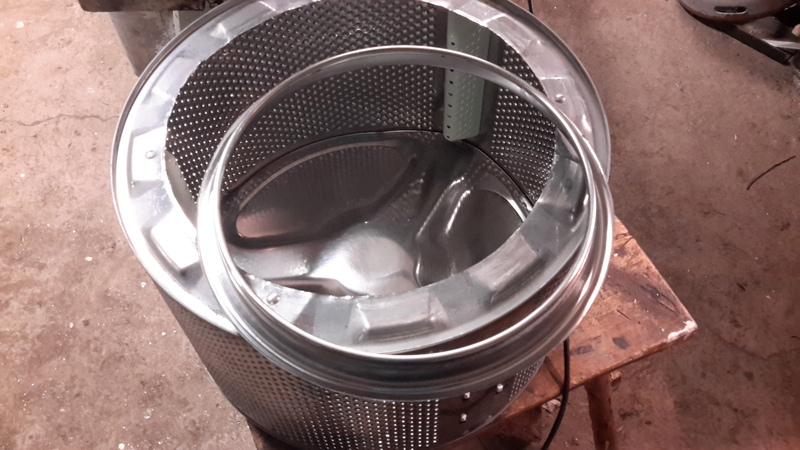 Cut apart drum from a broken washing machine. This flange will be my water gutter. 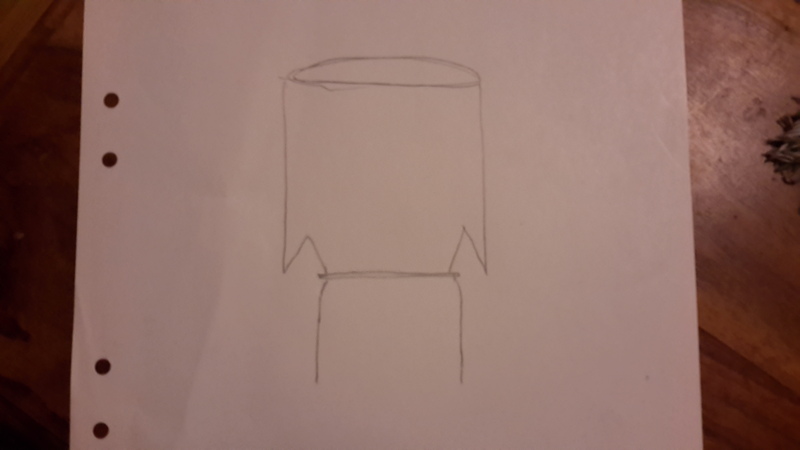 Will gutter 4" above firetube top be enough distance? That all looks good. I am honored. I’ve seen a little warpage on the shield plates, but generally are staying original shape. SS looks really good. your nozzles are long enough, don’t think you’d even need the plates… I’d go a little higher with your gutter but it may be enough with 4 inches. At first my thinking was to cut the moonshiner cone and reweld it to make the hopper wall make the gutter like in the picture below. Then I stumbeled on that washing machine. It seemed like an easy fix. But now I don’t know. Diameter will make gutter end up 1/3 down the cone and maybe even exposed to heat radiation from fire. Hopper will also get unnecessary tall. I might go back to my original idea.